Tiny Corners / jamie olson photography // Farfalle & olives. 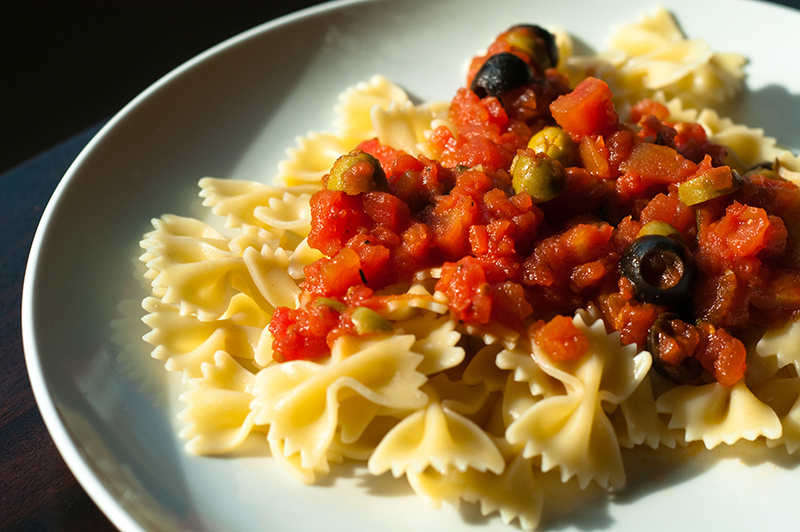 A few years back, my favorite store-bought pasta sauce was Barilla's Green & Black Olive sauce, which I think is a less saucier version of puttanesca. After a while, local stores stopped carrying it. I've always wanted to try to make it on my own, and tonight I finally did! On a side note, I've always thought it would be fun to be a food photographer. ooo... if you like olives. I'm gonna try and look up a thing we saw here yesterday. I've never seen it before, but it was served with our French bread slices last night at dinner (right next to a cheesy garlic spread). It was a spread make of finely chopped black and green olives. Tasted like it has some kind of vinaigrette in it. Little tangy, but mostly just tasted like good, fresh olives. It was freaking awesome. I'll let you know if I find out what it was. Mmmmm...that sounds so good! It sounds like you guys are having a great time - I'm enjoying the photos! looks amazing... i'm NOT a good food photographer... but i haven't tried too many times. maybe i will try again!